Some States Are Cutting Poor Dads A Deal On Unpaid Child Support In exchange for completing job training and parenting programs, Maryland is writing off some of parents' back child support. Similar efforts across the country are addressing the staggering debt. 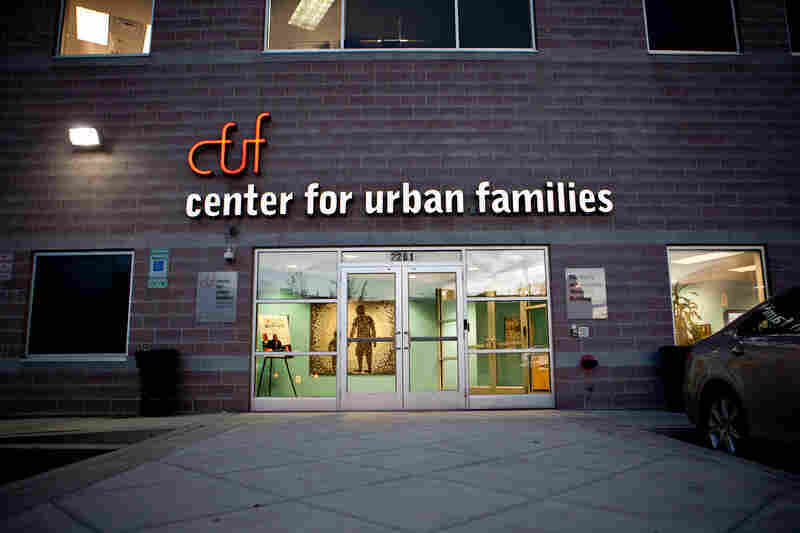 The Center for Urban Families in Baltimore (shown here on Nov. 11) is a nonprofit that provides job training, parenting programs and other help for low-income families. 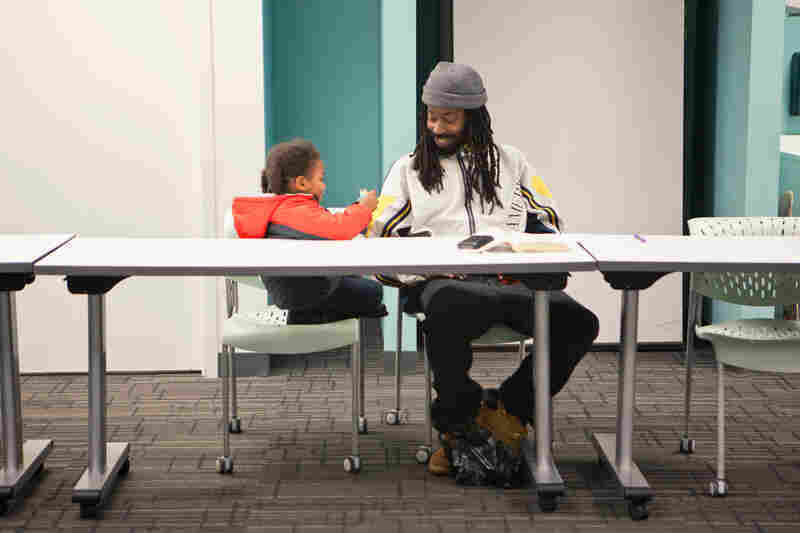 Michael Cornish, right, and his son Naeem, wait for a Responsible Fatherhood meeting to begin at the Center for Urban Families on Nov. 11. The weekly meetings are part of a program for parents to reduce their child support debt. Group leader Eddie White speaks during the meeting. Around two dozen men — 20-something to middle age, in sweats and in suits — sit in a large square each week and discuss topics ranging from parenting, debt and unemployment. Participants led by facilitator Eddie Pitchford (center) form the Chain of Unity at the conclusion of the Responsible Fatherhood meeting. "God, grant me the serenity to accept the things I cannot change," they chant. Participants are served dinner after their meeting. Maryland wants to expand its child support debt forgiveness program, hoping to help more parents to pay what they can. In just four zip code areas, the state identified 4,642 people who owed more than $30 million in back child support. Most of that was "state-owed," meaning that rather than going to the child through the custodial parent, it's supposed to reimburse taxpayers for welfare paid to the child's mother. This is a source of great resentment for many men, who say they want their money to go to their children. But most who owe it can't pay anyway, as they earn less than $10,000 a year. 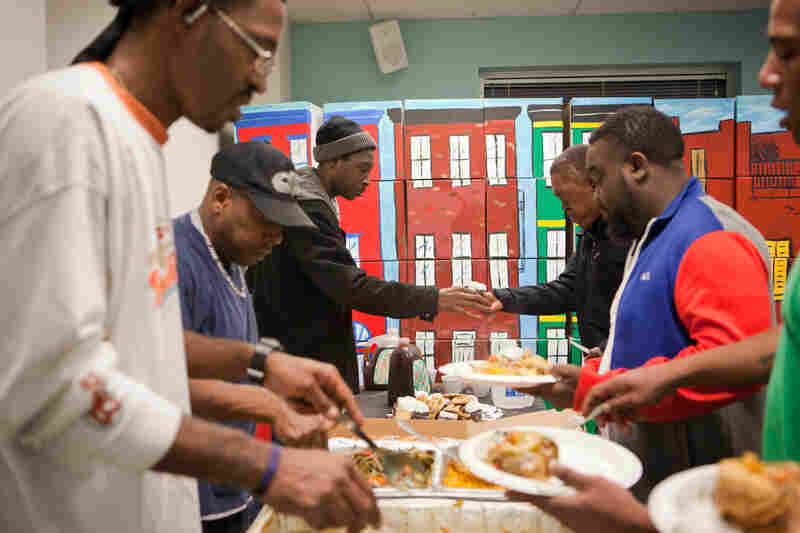 "So even if we use taxpayer dollars to chase 'em down, and we catch 'em, right, and we go into their pockets, there's nothing in there," says Joe Jones of Baltimore's Center for Urban Families. Joseph DiPrimio, head of Maryland's child support enforcement office, doesn't like that expression. "I think that's vulgar. I don't use it," he says. "We're talking about individuals that are economically challenged, they're underemployed, but they want to do the right thing," he says. Unpaid child support in the U.S. has climbed to $113 billion, and enforcement agencies have given up on collecting much of it. They say too many men simply don't have the money. What's more, research shows that high child-support debt can leave parents feeling so hopeless that they give up trying to pay it. Like a growing number of state government officials, Maryland's DiPrimio wanted to make parents an offer. But he needed their trust, and that was a problem. They made this offer: If the parent takes the center's month-long employment training course and lands a job, the state will forgive 10 percent of his or her child support debt. If they complete a Responsible Fatherhood program, the state will write off another 15 percent. One of the first persons to sign up was a mother, though the vast majority of noncustodial parents are men. In a separate "debt compromise" program, Maryland will also write off 50 percent of a parent's child support debt if they maintain monthly payments for a year. 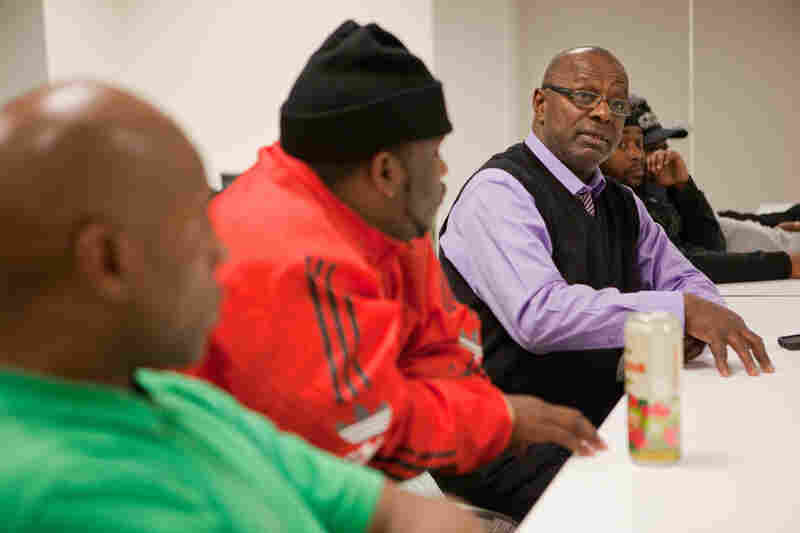 From left, Stephen Johnson, Harrelle Felipa and Cornelius Dixon attend a Responsible Fatherhood meeting at the Center for Urban Families on Nov. 11 in Baltimore. In exchange for participation in programs such as this, the state will reduce the men's child support debt. Some complain their exes won't let them see their child if they haven't paid child support. Others don't understand why it doesn't count as support when they take their kids out to eat, or buy them clothes — or say they would do those sorts of things for their kids if their child support obligation wasn't so heavy. "You telling me no matter what, I gotta pay. But I can't get a job to work to save my soul," he says. "If you know you got a criminal record, sure it's gonna be hard for you to get a job. But it don't mean you can't work," White says. "There you go, that's the word. Immediately," White says. "Immediately ask the court for an adjustment." Maryland's program is part of a larger effort to keep impoverished parents from racking up child support debt in the first place. "We sent out a teaser postcard trying to combat the ostrich effect," says Emily Schmidt, a research analyst with the U.S. Administration for Children and Families, who helped with the Texas effort. Schmidt says there was concern that someone going through the emotional transition of incarceration wouldn't likely be thinking about child support, and may not even open a letter from the state. So they printed the postcard on blue paper to stand out, and, taking a cue from marketers, it said, "Four easy steps to lowering your child support." After 100 days, the response rate among parents was up 11 percent, "a very low-cost intervention for a fairly dramatic effect," Schmidt says. The Obama administration wants to "right size" child support orders from the start, and has proposed regulations to make sure they are set according to what parents actually earn. Officials say some jurisdictions base orders on a full-time minimum wage, even if a parent earns far less. They say this can backfire, leaving so little money after a parent's wages are garnished that he or she quits and works underground instead. The White House's proposals also would provide more job training for parents with child support debt — something Ron Haskins of the Brookings Institution says is a good investment. "More fathers will get a job, more fathers will have earnings, and more fathers will use those earnings to pay child support," he says. So far, that's what's happened in Baltimore. The numbers are small. But the amount of child support that's been paid is more than double the amount of debt written off.